Join us for Fit & Fly Girl Ibiza, which will be held August 5 - 12, 2017, at Casa Lakshmi Luz, a bohemian chic private villa located in Ibiza. The retreat host will be Kathryn Stella, and the fitness instructor will be London-based personal trainer Chiara Pellegrino. 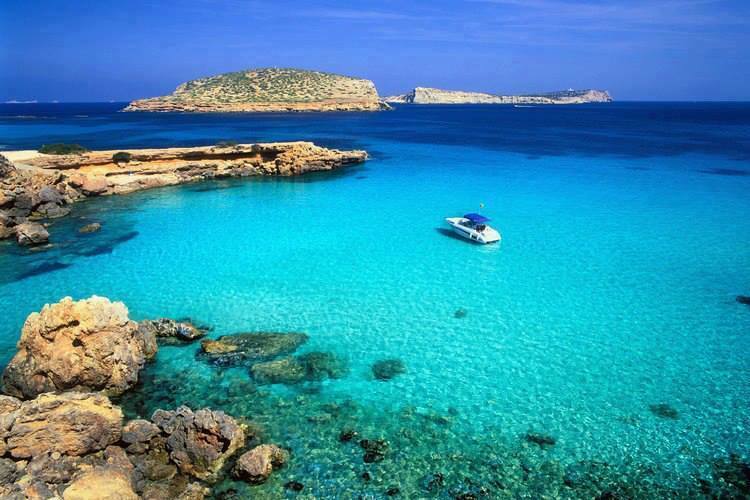 Ibiza is a Spanish island in the Mediterranean Sea just 50 miles off the coast of eastern Spain. The third largest of the Balearic Islands, Ibiza has two distinct personalities: There is the party side of the island where you can dance until 5 am to electronic dance music spun by the world's top DJs (and have the occasional Paris Hilton sighting). And then there is the rural side of the island, which is a throwback to Ibiza's roots of being a 1960s haven for hippies. It is this quieter, rural side that has seen a resurgence in recent years with yoga, meditation, and wellness retreats and a focus on spiritual growth and well-being. In that same vein, an iconic site just off the southern coast of Ibiza is Es Vedra, an uninhabited rock formation that is said to be the third most magnetic place on Earth with positive healing powers and creative inspiring energy. The island has over 11 miles of sandy beaches with crystal clear water offering a variety of watersports. Much of Ibiza, including its Old Town, Dalt Vila, has been designated as a UNESCO World Heritage site. The island is dotted with quaint villages and towns with boutique shopping that ranges from luxury goods to kitschy home decor, world-class restaurants, and, of course, that famed Ibiza nightlife. 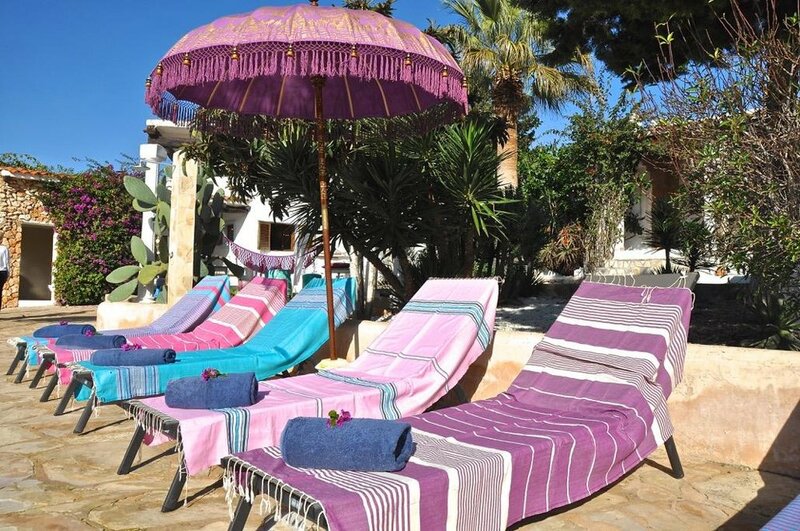 Fit & Fly Girl Ibiza will be held at Casa Lakshmi Luz, located just 5 minutes from the thriving community of Santa Eularia, 15 minutes from Ibiza Town, and 20 minutes from the Ibiza airport. The villa is a 200-year-old finca (farmhouse) that has been restored to incorporate modern day comforts while maintaining the charm of traditional island architecture. Like much of Ibiza, the decor of the villa is "hippie chic," including whitewashed walls, wood-beamed ceilings, chandeliers, dreamcatchers, and Balinese-style furniture. Casa Lakshmi Luz is set among beautifully maintained gardens surrounding a large pool terrace. The main doors of the villa open into an indoor shala, a multi-purpose room large enough for fitness and yoga classes. The villa has a large kitchen, a dining area that can seat up to 30 people, a dedicated spa treatment room, a sitting room, and a "tea and juice bar" area. Outside, the grounds have been thoughtfully planned to allow for private shaded spots and hammocks for guests. An outdoor yoga garden has a deck where fitness classes can be held in the open air. In addition to the indoor dining room, guests can dine al fresco under the trees. Gold - single room with 1 double bed, shared bathroom with "Silver"
Silver - single room with 1 double bed, shared bathroom with "Gold"
Casa Lakshmi Luz offers a personal chef who will prepare breakfasts, lunches, and dinners during the retreat as well as daily housekeeping and complimentary WiFi. Chiara will lead daily fitness classes, including HIIT, cardio, strength and conditioning, and a fitness program she created for women, TotalBody, which includes a mix of cardio and resistance training set to music and suitable for all fitness levels. One complimentary 60-minute massage for each guest will be provided at the villa. The group will kayak to Benirras Beach for the Sunday drumming session and watching the sunset over the "Finger of God." One day during the retreat will be spent on neighboring Formentera island where guests will enjoy lunch and time to lounge by the pool or beach at Gecko Beach Club on Formentera followed by a private snorkeling trip around the island. The group will enjoy morning yoga taught by a local yogi, breakfast, and lounging at the luxurious Amante Beach Club on Ibiza. Guests will also experience a private guided tour of Ibiza Town's UNESCO World Heritage site and medieval walled village, Dalt Vila. One night during the retreat, the ladies will dine at the famous Lio, a restaurant, lounge and cabaret show frequented by celebrities. There will also be opportunities to shop Ibiza's boutiques with unique clothing, jewelry, and gift items. For a supplemental fee, we are able to arrange any additional activities you would like during your retreat, including stand-up paddle boarding, sailing, snorkeling, waterskiing, surfing, parasailing, scuba diving, kiteboarding, a day at the spa, or a VIP girls night out in Ibiza's best nightclubs. Fit & Fly Girl Ibiza builds plenty of free time into the schedule each day to relax and sit by the pool with a book, get a massage, take a nap, or simply hang out in the villa with the other women. Kayaking to Benirras Beach for Sunday drumming session and watching the sunset over the "Finger of God"
Rates do not include airfare to and from Ibiza; airport transfers to and from the villa; alcoholic beverages; one lunch and one dinner during the retreat, which will be held at local restaurants in Ibiza; additional spa treatments or supplemental activities; or optional gratuities for fitness leader, spa therapists, or villa staff.